It was interesting for me to learn about computers in English. Of course it was difficult. In fact textbook was boring. I don't understand why this class exists. Fortunately my teacher was very nice, so I enjoyed this class. Not only teacher my classmates was very nice. I was very happy. I learned German. It was interesting than IT class. From April I will work. My job is concerned with computer programs and systems, so I would be able to put my knowledge of computers to account. I will never forget what I learned from this class. I want to continue my study about computers and English. Thank you. When I entered this school, I worried about my future. Because I failed to enter the University again at that time. I wanted the time to think about myself. At the beginning of school life, I couldn't enjoy it. But, as I was blessed with good friends, I could think positive with my life. And I could have new dream. Now I'm doing my best to my dream. It was good choice to come to this school. And I appreciate my parents who gave me the time to think, friends who gave me spirits and Kanda teachers. I want to say thank you to them. I am glad to see you and to take your lessons, Markus. Japan is nice country, isn't it? I hope your success as a teacher in Japan! See you! Thank you very much. I think I enjoyed having this class in my own but I have a lot of impressions about it. It's just suggestion. It's not a complain about you. please believe me! First, there is no computer in this class. If thre had been computers in this class, we would have had a good time and understood computer more. Second, there are a lot of terms that I don't understand on this text book. This makes our interest about computers distract, I think. At last, this class should be an elective subject. I think the person who is interested in IT English will choose this class. This is a good idea, isn't it? I hope my idea accept the president of KIFL. What I want to say actually is thank you for teaching us about IT English without anger and sorry for sleeping sometimes. I apologize you. You are a good teacher. What I regret is that I wihs I were taught German by you. It was much fun for me. We will graduate from KIFL, but if you are still in KIFL next year, I will meet you if I have time to do so. I wish your success and health. Please continue to drink non-calorie burugari juice every your class. I am going to work at Hilton Tokyo Bay which is located in Maihama, so if you go to Tokyo Disney Land, please come to meet me! I am looking forward to seeing you. Thank you very much. I'm very glad to meet my friends and teachers. I'm satisfied with KIFL, because I was able to get computer skills in the KIFL life. I am sure that the computer skills can help me in the future. I was also able to change my mind about working. When I was a high school student, I didn't want to work absolutely. However, I gradually thought "I want to work", by the grace of computer class and business protocol class. My first time to use English practically is in a fast food restaurant in Makuhari. I and my friend helped a Filipino who was puzzled about change. I was happy to help him, and I thought it was good for me to learn English. In the near future, Information Technology will gradually become common knowledge what we have to know. We were fortunate learning English for Information Technology. The most biggest thing that I learned at KIFL is that effort is the most important thing to learn English. Talent is not problem to learn English or other languages. It's just matter how I make efforts. Even it's a small thing, such as memorizing 10 words a day, doing continuously is very important. I realize that it can be said for everything. One famous person said, "Genius is one percent inspiration and ninety-nine percent perspiration." I don't want to be a genius but I believe it and I wand to try anything even though I think it's difficult to do. I also learned that the atmosphere in class has great influence on students in good way and in bad way. On the othre hand, I know a lot of bad things about KIFL. I've felt there are some lessons that I think I don't need, especially in the second grade. We should choose classes and teachers we want to learn from because we spend a lot of money on this school. If we could so, there may be popular teachers and not popular teachers and it could be a good chance for teachers to reconsider their way to teach. In IT class, the text uses easy words to understand so I learned a lot about computers, but we should use computers in this class. Thank you for this one year. After I entered this school I found effort makes me better. If I slack my work nobody would not in troble. It's only my fault. Only I can make progress in my English and myself. I came to school by jammed train with very heavy bag. It's hard to get up early and I hate jammed train. A day has 4 lessons is hard to me but decided to enter KIFL was my choice so I went to school in time. It's good training to me because I'll be a worker from April. There are many native teachers here. It's good to study English. Some lessons were boring it was like study period. 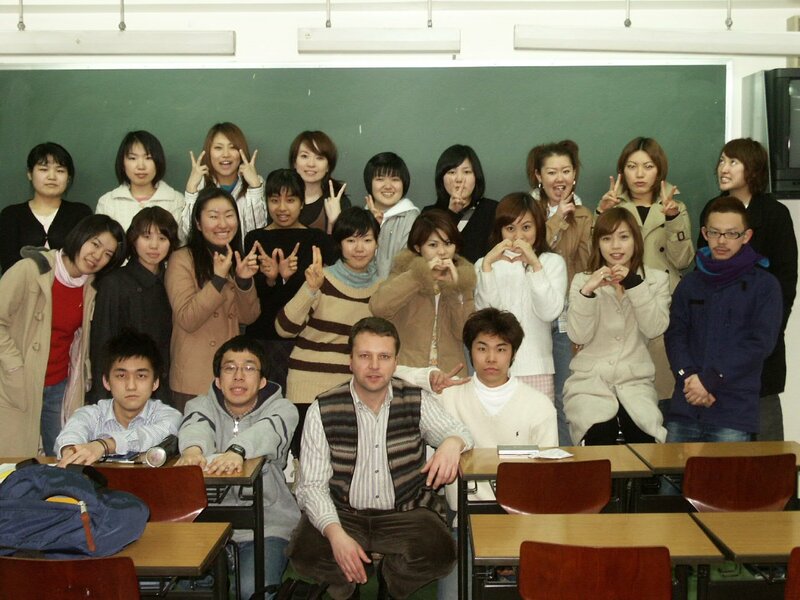 I had good classmates of translation course. They (and I) were sometimes chatting but they studied hard. EIC classmates always complaining about the teacher without they do nothing. I don't like that attitude. IT English has many techinical words. You always explain politely but I'm unfamiliar with the IT. I wanted to learn another lesson from you. Thank you!! What I learned at KIFL is, of course, the capability of listening, reading, writing, translating, and speaking in English. And I also learned how to communicate with others in English. However, I also learned the importance of my friends and my family in my life. The best thing that I learned is to go my way with positive thinking. I took some exams to enter an university before I came here. Unfortunately, however, the lack of ability caused disqualifications. Therefore, I was plunged into the depths of despair. At that time, a woman, who taught me English for 5 years when I was young, gave me a great phrase as encouragement. She gave me "everything happens for the best". And she said, "this is the best way for you!" I was very glad to be given that phrase from her! Therefore, I got over it and I decided to belong to KIFL to study English, because I like English very much. After I entered KIFL, I came across difficult problems in my life. However, I always got over them with the positive thinking. In IT-English class, for instance, I had to have a presentation about IT with my friends. At the beginning of our activity for it, we were in trouble about it, because it was really hard for us to understand and explain about IT. However, with positive thinking, we could get over it!! And we made a great presentation!! That’s why I could have learned the importance of my friends and my family. I’ve been negative about anything since I was born. I should be more positive every time to enjoy my beautiful life!! I enjoyed school life in kanda. Especially I could learn computer skills and knowledges. I couldn't use word and excell at all when I entered this school. But Now I can type keyboard without looking and send a e-mail easily. I learned many vocabulary about computer through the textbook and presentation. My speaking ability is not so improve I think, compareing with listening. Anyway these memories in kanda may remain in my heart forever. Thank you and see you. I`ve learned some vocabrary on it IT in this class for a year. I think I couldn`t study it unless I took IT English class. It was important but difficult for me to study. As we know, It is so easy for us to memorize the words related to IT English in Japanese, but not in English. We should keep learning by heart the stuff like those that we`ve ever learned for two years in this class. It must be useful even if we don`t work at the place on computer. I've studied at school like out of duty up to now. I don't care about the day when I stop studying at school will come soon. Compulsory education made me enjoyable. I studied, ran around the ground and clean the classroom obediently. When I was junior high school student, I fell in love innocently. However, one thing changed myself in high school. That's club activity. I belonged to volleyball club and was very glad to come across the sport named volleyball. That's for the first time to get absorbed in one thing. As if I went to high school to play volleyball. I love playing volleyball and greatly satisfied with volleyball for the first time. I could have started playing volleyball more earlier. Then, I might be a volleyball player now. Lots of hardships distress me over and over again for 3 years, but I was never discouraged because I was confident of loving volleyball better than any other clubmate. I like playing volleyball and of course like clubmates. They're my important companions who brew sweat and shedded tears together. 3 years of volleyball life and the companions are my treasures in high school. I believe to keep company with them forever. However, I was familiar with English since 12 years old, so I got into English school, KIFL, met many kinds of people and went to British Hills. That's very enjoyable, but I often dozed in a class because of too much part-time job. Especially, in IT class of second year, a teacher always worried about my condition. I'm very sorry about my doze, but the teacher is very kind. I felt his warm-hearted. In March, I'll finish all of the school life and be the one in a society. I want to be a warm-hearted person like him from April. Everything I've learned and time I've spent are never useless. From now on, I'm going to make my history. In the first year, I had 2 IT classes which told me how to use WORD and EXCEL. It was a little bit boring for me because I had already learned them more deeply in the high school, but my typing skill had improved and became more faster though. This year I learned something new. ACCESS and Power Ponint. Teachers made us to do too much work and it was really hard to follow the direction with the thick textbook. But I think it was the most useful thing I've learnet in this class. And the IT-English, I didn't get the meaning of learning PC without actual PC, at first. But it was pretty interesting to study about inside of PC or information technology and if I didn't study this, I never known the structure or the history of computers. At finally, the thing I've most appreciated to KIFL was the free internet that I can use it as much as I want. Since I don't have a computer at my house, I use it almost every day to search the information or check E-mail from school. Of course I'm sending this to you from study room, right now. It's nearly 9 O'clock and the school closes in 10 minutes. So, see you next Tuesday. My school life at Kanda has almost finished. I met nice friends and teacher here. To tell the truth, I didn't like IT-E class the worst when I was in the 1st grade. We had to read our report to the class and I was very bad at speaking in front of lots of people. Moreover, I didn't know about computers at all. Thanks to my classmate who are really nice, I didn't become tense when I was in the presence more than ever. My voice sometimes shivers with strain. In the 2nd grade, I managed to understand English, and I has come to find a delight in IT-E. I can learn English and computers at the same time. In this class, we went to Akihabara to study computers' equipments such as motherboard, LAN, and so on. It was very fun for me. I was interested in computers, but I wasn't in computers' devices. It was the day that some unclear things about computers cleared. I am nearly in tears when I think we can't see each other every day soon. Two years in Kanda was in an instant. I spent my final school life to the fullest. I want to study here again after marrying or having my children. Thank you for your pleasant class! First, in comparison with my entered KIFL, computer has become more common thing. And I learned a lot about many ways of computer. At this time every various information is in it. Therefore I'm sure that I learned at KIFL for 2 years was good for me. And your lesson was easy for me to learn com puter! And thanks for taking native teacher's class, I've improved in listening, speaking and more common expression and vocabulary. Besides my older sister who speaks English told me I spoke English more fluently!! I believe that my school life was never wa ste of time. 2 years friendship was precious treasure for me as well. I'm very happy about a fateful encounter with everyone. THANK YOU ?(^o^)? I feel time flies. I look back at school life at Kanda, I have a lot of memories. At first it was hard to be used to school life, living alone and part-time job. However I was able to get used to these gradually and enjoy school life. When I was a first year student, we played skits which were so enjoylable. Because of it we could be friend easliy. These are my shool life memory so I'll write about IT English class next. When I was a first year student, we had to give presentation. It was so hard to give it because we did'nt know about IT but we would try our best. In this class, going Akihabara was good memory for me. We rarely go out with classmates so I was glad to go out and look around equipments, for example, motherboards. Thank you for teaching us IT English. Finally I wanted to learn German from you. I got not only English skills but also computer skills in KIFL. I hadn't used a computer until the first class of ITA at all. Then my father bought a computer. So I could practice typing and so on at school and home. Within two years, I got very useful skills with a computer. Using Word, Excel, Access Powerpoint, Publisher, Internet and E-mail. I will be able to utilize these for my work after graduation. ITEnglish also must be useful and interesting in itself, I think. But classes wasn't substantial, especially last year's. We translated our assignments of the text partly. I enjoyed only making emoticons (smileys). This year, Markus tried to not give boring lessons. The most enjoyable information of the class was about Alicebot. And there were some interesting topics in the text. But reading the text made me sleepy, honestly. The text has many letters and some monochrome pictures. It's not enough to learn pleasantly and understnd informations as familiar things. Thank you for your teaching us for 1 year. Last IT English class was so boring, so I felt hard to understand this class at first. But you gave us many timely and useful information . Especially, I like Alice robot. I enjoyed them. By the way, thinking my KIFL life, I wold say I had a very good time. I was able to learn English everday and I've met a lot of friends who love English. I was interested in translation before I came here, so I'm very happy to take translation class. We translated many kinds of material. I don't want to forget my KIFL life. In 2 years, I've studied many things. Now I think this 2 years are too short. There are 2 good points about KIFL. First thing I think teachers in career center are very nice and they always helped me during I was doing jobhunting. Therefore I could get my job. I really appreciate about it. Second thing KIFL is located in very good place. It takes me only 2 or 3 minutes to get here. so even I'm being late, I can arrive here very quickly. I want to complain few things about KIFL. First thing is spring vacation is too short for second year student. Most of unversity and professional school begin spring vacation from beginning of February. But in KIFL it begin from 8th of March. I think it's stupid. We can't ready for our new job. We can't change ourselves student to social workers. I want time to change my way of thinking. Second thing is some EIC teachers have no motivation. We're paying school fees, so they should have motivation. Lastly I am going to write about IT English. I have one problem in this class. We can't use computer in this class. This class name is "IT English", but can't use computer. I think it's very strange. I am wondering about it from first year, but it still doesn't change. KIFL never listen to our opinion. I hate it. However I made lots of good friends in KIFL, so I could enjoy school life in KIFL. The strong point of KIFL are good relationship between teachers and students, and friendly atmosphere. In this school, there is no unified procedure of teaching. Each teacher teaches classes what they like. It has advantages and disadvantages. Off course every teachers has good educational background, are smart, elite. But they do not mean they are good teaching. It's unfair if my teacher is stupid and awful. Other class teacher is good in same subject. Every students paid same school fees. We have the right to take worthwhile class. Some teacher's class is waste of time and money. Some teacher’s class is exciting and instructive. KIFL must improve the difference. The questionnaires which students fill out at the end of term don't make the most of result. The teacher who had bad estimation should be examined by other KILF’s teachers. Teachers who are not good teaching should study how to teach. I have studied many subject for 2 years. I was also learned by many teachers. I understand that teachers charactor reflects each classes. My favorite classes are translation classes, because I like to work silently and steadily. I think I am right to take the translation course. I also think ITB and ITC was good for me. To tell the truth, I don't like the computer classes, but I could study many useful skills in the class. Therefore, I can say these classes are good for me. On the contrary, I hate BP class. I couldn't understand the meaning of the existence of the class. This class kept making me sick from the start of a day. Anyway, I have been going to the school for 2 years that takes 2 hours from home, I'm sure that I got something special. I already graduated the university and I worked 1 year before I entered the school, so I really appreciate for all people around me to be experienced a lot of precious things. Finaly, I want to say thank you to Mr.Grasmuck.